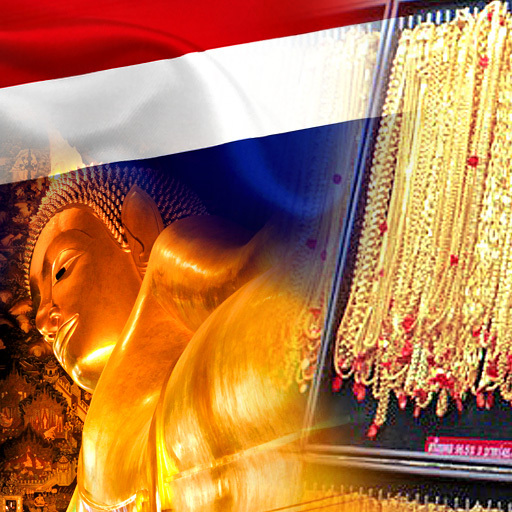 Physical gold is intrinsic to Thai culture and is held in high esteem as a store of value. Similar to the Indian perspective, gold in Thailand is held as an investment for financial security, is gifted during weddings, and is central to religious ceremonies. Also similar to India, gold in Thailand is often purchased in the form of jewellery, but also in the form of bars and coins. A number of bar shapes are peculiar to the Thai gold market such as doughnut and boat-shaped bars. In the ancient Pali language, the former name of Thailand, Siam, is derived from शुभर्नभुमि (Suvarnabhumi) which means “Land of Gold” or “Golden Land”. In Thailand, the standard fineness for gold is 0.965. This is commonly referred to as 23 karat, although 0.965 is technically 23.15 karat since 23 karat would be 23/24 or 0.95833 fineness. The standard weight unit for measuring gold in Thailand is the traditional ‘Baht’ unit, with 1 Baht = 15.244 grams or 0.4901 troy ozs. With 1 Baht = 15.244 grams and a fineness of 965, this means that there are 15.244 * 0.965 = 14.71046 grams of pure gold in a 1 Baht weight unit. A subdivision of the Baht weight is Saleung, with 1 Baht = 4 Saleung. The Baht weight should not be confused with Thailand’s national currency, the ‘Baht’, although like a lot of paper currencies, the name ‘Baht’ (the Thai paper currency) is derived from the historic precious metals weight measurement, the ‘Baht’. The Gold Traders Association, founded in 1983, is the representative body for the gold industry in Thailand. The Association’s objectives include assisting member companies in business, commercial and economic activities, promoting member companies commercially, facilitating research and the exchange of commercial and academic knowledge about the gold market, and monitoring developments including price developments in the Thai and international gold markets. Each day, and multiple times per day depending on the movement in the international gold prices, the Gold Traders Association publishes gold prices quoted in Thai baht for both 965 fine gold and 9999 fine gold. In practice, the Association’s Board of Directors, drawn from member wholesalers, major retailers, and gold importers and exporters actually make the determinations of the gold price, by converting the international spot price to Thai Baht using the USD/THB rate, and also aiming to choose a price that will ”be consistent with a balanced market in the country and abroad”. Determined prices are then displayed and used by Association members in their daily gold trading transactions. All the main Thai gold dealers quote buy and sell gold prices for both 965 fine and 9999 fine gold based on the Gold traders Association disseminated prices. Since the Thai Baht to US Dollar exchange rate is relatively large (for example 36:1), the Thai Baht price of gold in either ‘Baht’ weight or troy ounce weight will invariably be a large monetary number. For example, if the US Dollar price is $1100 per ounce for 995 gold, the Thai Baht price for 1 ‘Baht’ weight unit of 965 fine gold would be approximately THB 18,600 at an exchange rate of 36:1. The Gold Traders Association therefore only quotes price movements in increments of THB 50 because to quote lesser movements would be too cumbersome. According to the World Gold Council’s Gold Demand Trends Q3 2015, total gold bar and coin demand in Thailand in 2014 reached 96.4 tonnes . The same report put Thai gold jewellery demand in 2014 at 12.4 tonnes. This created total consumer demand for gold of 108.7 tonnes in 2014, which was the 3rd highest Asian country gold demand total behind India and China. The previous year, in 2013, when Thai gold imports spiked relative to 2012, the World Gold Council alluded that some of Thailand’s gold imports most likely represented gold being channeled to other markets, notably India and Vietnam, although lower domestic prices were also said to have been behind the 2013 gold import spike. Most gold imported into Thailand is sourced from Switzerland, Australia, Singapore, and Hong Kong. Gold futures contracts trade on the Thailand Futures Exchange (TFEX). TFEX was established in 2004 and is governed by the Thai Derivatives Act (2003). TFEX is a subsidiary of the Stock Exchange of Thailand (SET) and is supervised by the Thai Securities and Exchange commission (SEC) which reports to the Ministry of Finance . There are two gold futures contracts listed on TFEX, a 50 Baht gold futures contract launched in February 2009, and a 10 Baht gold futures launched in August 2010. TFEX also lists equity index futures, USD currency futures, and futures on products such as Brent crude oil and rubber. A silver futures contract that was launched on TFEX in June 2011 was discontinued in 2014. As of May 2015, TFEX had 42 fully licensed member companies. The underlying asset on both the 50 Baht gold futures and 10 baht gold futures contracts is gold with a purity of 0.965 fine. With 1 Baht = 15.244 grams, the contract size on the 50 Baht contract is 50 * 15.244 grams = 762.2 grams, while the contract size of the 10 Baht gold futures contract is 10 * 15.244 grams = 152.44 grams. Both gold futures contracts are cash-settled, and the final settlement price is based on the gold price from the morning ‘LBMA Gold Price’ auction on the last business day of the contract’s trading cycle. The TFEX website also lists the LBMA Gold Price used for final settlement prices for recently expired contracts. Price data for both TFEX gold futures contracts can be viewed on the TFEX website . Trading volumes in both TFEX gold futures contracts have tailed off substantially in the last few years relative to the 2011-2012 period. Following launch in February 2009, annual trading volume in the 50 Baht futures contract reached 311,000 contracts in 2009, rose to 973,000 in 2010 and 1,817,000 in 2011, but has fallen dramatically since then to 238,000 in 2014, and just over 130,000 contracts traded during 2015. Average daily volume peaked at 7,449 contracts in 2011, but in comparison only reached 550 contracts per day in 2015. A similar trend is observable in trading volumes for the 10 baht gold futures contract. Following launch in August 2010, volumes reached 2,172,000 in 2011, 2,597,000 in 2012, but then contract trading volume fell to 1,300,000 in 2014 and a similar level in 2015. Average daily trading volume on the 10 Baht contract has therefore nearly halved from 10,600 contracts per day in 2012 to 5,500 contracts per day in 2015. Another broker, GT Wealth Management, was founded later in 2009 as a joint venture between a number of entities within the Thai Gold Traders Association, and it too received a gold futures trading license in 2009. There are also a number gold shops that operate on behalf of the gold futures brokers which are known as ‘selling agents’. These selling agents are authorised to open gold futures accounts on behalf of the TFEX gold futures brokers and to place customer orders with the brokers. Staff responsible for gold futures business at these selling agent companies are required to hold a derivatives trading license issued by the SEC. YLG’s gold business began in 1993 as the Yoo Lim Gold Factory Ltd.Yoo Lim Gold was established to manufacture and export gold jewellery to international markets such as the US, Europe, Australia and Asia. Ten years later in 2003, YLG Bullion International was established for the importation and trade of international standard gold bullion of 9999 fineness. YLG Bullion International imports and distributes investment gold bars from mints and refineries such as the Swiss refineries PAMP, Valcambi, and Argor-Heraeus, and also Mitsubishi of Japan, and the Perth Mint of Australia. YLG also offers own branded investment gold bars of 965 fineness stamped with the ‘YLG Bullion International’ logo in denominations from 1 Baht up to 50 Baht weight units[fn YLG International Bullion, local .965 fine gold bars http://www.ylgbullion.co.th/en/gold-96-5]. Through its YLG Bullion & Futures Co Ltd subsidiary, YLG was one of the first TFEX market makers for TFEX gold futures contracts. YLG has also established an office in Singapore called YLG Bullion Singapore Ltd Pte. MTS Gold has operated in the Thai gold market for over 60 years, and is one of the largest importers and exporters of gold in Thailand and South East Asia. MTS refers to the original ‘Mae Thong Suk’ name. The group sells gold to jewellery fabricators, gold dealers and wholesalers, and to individuals via its shops and an online platform. MTS Gold imports and exports 9999 gold bars from the four large Swiss refineries,namely Metalor, PAMP, Argor-Heraeus and Valcambi, and also from the Perth Mint of Australia, South Africa’s Rand Refinery, Mitsubishi and Nippon Mining of Japan, and from Germany’s Commerzbank . MTS has its own refinery in Bangkok which has an output of up to 500 gold kilobars per day, and which produces ‘MTS brand’ 965 gold bars in denominations from 1 Baht up to 100 Baht size, and 9999 gold bars in denominations of 100 grams, 500 grams and 1 kg. These MTS bars are well-known throughout Thailand. MTS also hosts its own gold spot trading platform called ‘MTS Gold Online’. Ausiris Co, part of the Baan Chang Thong Group, was established in 2005 as a gold trading company. Its head office is in Bangkok, and it has branches offices in other Thai cities including Chang Mai, Rayong and Pattaya. Ausiris sells its own brand gold bars of 965 fineness which are manufactured by the Umicore precious metals refinery (see Umicore below). These Ausiris bars are denominated in 5 baht, 10 baht, 20 baht and 50 baht weight units. Ausiris also offers own branded and PAMP branded bars of 9999 fineness, both types of which are manufactured by PAMP in Switzerland. The Ausiris branded 9999 bars are fabricated in 10 and 20 baht weights, and the PAMP stamped bars are in the international standard denominations of 100g and 1kg weights. Ausiris Futures Co Ltd, a subsidiary of the group, acts as a TFEX market maker for TFEX gold futures contracts. The Yarowat Road area in Bangkok’s Chinatown is the centre of Thailand’s gold industry and hosts a large concentration of gold shops selling jewellery and gold bullion. One of the longest established and most reputable gold shops in Chinatown is operated by the Hua Seng Heng group. The group operates a fold refinery and is a gold bar manufacturer, and has also established Hua Seng Heng Commoditas which imports and exports gold, distributes investment gold bars, trades in gold scrap and operates gold savings plans. Along with Ausiris, YGL and MTS, the Hua Seng Heng group established Hua Seng Heng Gold Futures in 2009 as one of the first four dedicated gold futures brokers for TFEX gold futures. MKS, the Swiss precious metals group which owns the PAMP gold refinery, has a Thai branch office, MKS Precious Metals (Thailand) Co Ltd, in Khet Sathon, Bangkok. In July 2014, the large Thai gold dealers came together to support a plan to establish a spot gold exchange in Thailand under the auspices of the Stock Exchange of Thailand(SET). These dealers were YLG, MTS Gold, Ausiris, Classic Gold Futures, Hua Seng Heng Commodities, Globlex Holding Management, and GT Gold Bullion. Although the dealers had been discussing a gold exchange for a number of years, the Bank of Thailand had re-initiated the idea in 2013 as it was interested in more closely regulating OTC trading in the physical Thai gold market. By August 2014, it was reported that the gold spot exchange was delayed due to discussions on how it would be structured. By May 2015, the plan for the spot gold exchange was still delayed due to what SET called currency trading limitations and limitations on a “physical gold delivery requirement”. By July 2015, it appears that plans to launch the spot gold exchange via SET had been scrapped with the explanation that it wasn’t commercially viable. At that time, the Gold Traders Association was planning to ask SET for a definitive answer on whether the gold exchange would go ahead. Currently, there is no further update on whether the spot gold exchange will go ahead or not. Umicore, the world’s largest precious metals refiner of recycled materials, which operates precious metals refineries in Belgium and Brazil, also operates a precious metals refinery in Bangkok which refines precious metals from recycled materials. The output from Umicore’s Bangkok refinery includes investment grade fine gold bars. The Bank of Thailand holds 152.4 tonnes of gold in its official international reserves, which is the world’s 26th largest central bank gold holding, and just ahead of Singapore’s 127.4 tonnes of official gold holdings. Like many emerging market central banks, the Bank of Thailand has increased its gold holdings since the 2007/2008 financial crisis, and purchased an additional 68.4 tonnes of gold over the period 2010-2011, bringing its previous total of 84 tonnes up to 152.4 tonnes. The Bank of Thailand has declined to confirm where it stores its gold reserves. The first 4 ETFs listed above were launched in 2011, the final one launched in 2012. By assets under management (AUM), the KTAM Gold ETF (GLD) is the 3rd largest ETF on SET, while the K Gold ETF (KG965) has the 5th largest AUM of Thai listed ETFs. KTAM Gold ETF is essentially a Thai feeder fund that invests in the well-known New York listed ‘SPDR Gold Trust’, hence the GLD ticker. KTAM gold ETF therefore acts as a tracker for the price of 995 fine gold bullion. K GOLD ETF (KG965) offers exposure to domestic 965 fine gold bullion. ThaiDEX Gold ETF (GOLD99) offers exposure to the price of 995 fine gold bullion. Bualuang Chay Gold ETF (BCHAY 965) invests in domestic brand physical gold bars of 965 fineness: http://www.bangkokbank.com/BangkokBankThai/Documents/Site%20Documents/Mutual%20Funds/2015/BCHAY_6MonthReport.pdf]. Thanachart Gold ETF (TGOLDETF), launched in 2012, invests in 999 fine gold bullion. In some ways, the Thai gold market could be called the German gold market of Asia. As the German gold market is overshadowed by that of London and Switzerland, Thailand’s gold market is often overshadowed by the larger gold markets of both China and India, . But like Germany, the Thai market regularly records a very respectable 100+ tonnes of annual gold demand. The Thai gold market is also overshadowed by the fame of the financial centre of Singapore to the south, but is larger in physical market activity than any of its South-East Asian neighbours (Malaysia, Singapore, or Indonesia). More recently, the Thai market has embraced modern forms of trading such as gold futures trading, but notably this has involved the cooperation of the powerful industry groupings within the Gold Traders Association. If a formal gold exchange involving SETS is ever to come on stream in Bangkok, it too will undoubtedly require similar cooperation from the incumbent physical gold operators. Copyright Information: BullionStar permits you to copy and publicize articles or information from the BullionStar Gold University provided that a link to the article's URL or to https://bullionstar.com is included in your introduction of the article or blog post together with the name BullionStar. The link must be target="_blank" without re="nofollow". All other rights are reserved. BullionStar reserves the right to withdraw the permission to copy content for any or all websites at any time.